Outwith the railway industry nobody seems to care. This sad state of affairs is another example of the lack of even-handedness with which society, including government at all levels, regards road traffic and rail traffic. The roads authority pleads the risk of frightful carnage to all sorts of people if a big strong steel bar is erected in front of a low bridge so that it is hit, rather than the bridge, alerting the driver to a greater risk immediately ahead. It is thus very difficult for such a sensible (in both meanings of the word) device to be erected. A passenger death on the railway is headline news for several days; a passenger death on the roads is just one of about 15 or so "we" expect (and worse, tolerate) every single day. Billions of pounds are spent on road improvements, yet the daily cost of motoring has been frozen for several years. Annual fare increases on the railway are needed "to pay for the improvements". Back to bridge bashes. If a bridge is struck NR has to check that it is safe for trains to pass over it. This inevitably takes time and costs money. Passengers are delayed and are entitled to compensation. The average cost to NR is some £13,000. The actual cost, factoring in the sort of "value per minute saved" figures used to justify (or prevent) new railway, is undoubtedly considerably greater. If I, as a passenger, can claim a 100% refund of my ticket then my compensation is limited to that amount. If in consequence I suffer further loss the railway has no way of capturing that figure - a situation which was raised in FNE 75. 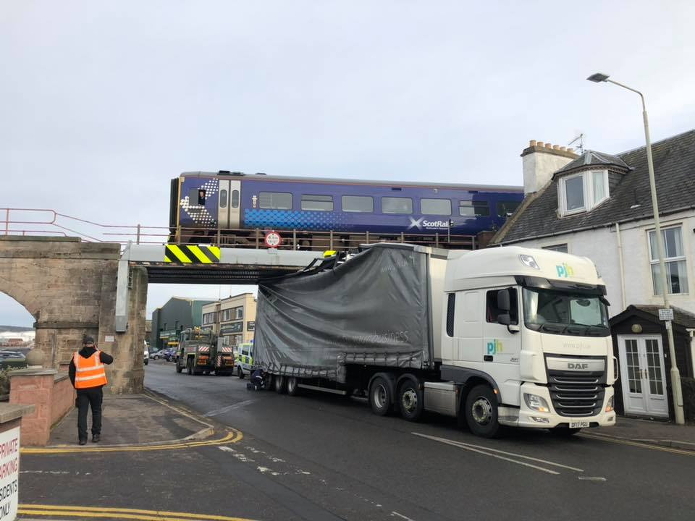 There was a widely-publicized picture of a lorry delivering top-of-the-range cars which had squashed several of them under a low bridge in Perth (13' 0"). A less widely-known picture [below] of a lorry snugly fitted under a bridge in Inverness (12' 0") has the name of the haulage firm clearly visible: pjh, whose strap line is, serendipitously, "together we're better". Road-rail integration is all very well, but perhaps not quite this closely. NR's Scottish people check Control's logs daily for incidents of damage (mainly bridge bashes, but also less than skilled use of level crossings). If the log provides contact details a standard Letter of Liability is sent, seeking the 3rd Party insurance details. If no contact details are provided a request is made to DVLA or Police Scotland for details. This takes time, but eventually the Letter of Liability is sent. NR's claim falls, like All Gaul, into three parts. Train delays. Trains are cautioned (i.e. run at much reduced speed) or stopped altogether until the bridge inspectors carry out their inspection. Trains then run cautiously or at full speed unless the bridge requires closure. But there's more. If I, as a car driver, act "without due care and attention" or - worse - if my driving is "dangerous" I am liable for prosecution. It seems, however that the Crown Prosecution service isn't bothered about prosecuting drivers striking bridges because no-one is hurt. (This is the off-the-record view of a lawyer quoted in RAIL 867.) However we are surely on borrowed time - while most low bridges are in towns not all trains stop at all stations, and some hurtle through at high speed. One of the frequent victims is the bridge carrying the A607 just north of Grantham station. LNER's fine trains pass over it at a speed sufficient to cause dozens of fatalities were the track to be shifted sideways by a few inches. Does the CPS need to wait for this to happen before setting useful examples? And what about the passengers on the upper deck of a bus crushed by being driven into a big strong steel structure? Does CPS not have a duty of care to them? It is heartening that in her second Editorial Stefanie Foster reports that, following the first, NR have shown interest in vibration sensors on bridges to alert them of a strike. The railway takes bridge strikes seriously, as it should. The rest of society shrugs its shoulders and notes that no-one has been killed. Yet. I am indebted to a Network Rail spokeswoman for lifting the veil on what goes on; and to RAIL 865 and 867 from whose articles by Stefanie Foster "Five bridge strikes every day" and "Bridges: it's time for action" I have shamelessly, and without permission, lifted the five leading bullet points and other details. As the Prince of Wales before the present one said when doing a walkabout in South Wales, Something must be done.